FROGWARES has released a THE SINKING CITY TRAILER featuring some deliciously Lovecraftian gameplay. THE SINKING CITY is an investigation game based on the works of HP Lovecraft that was shown off at this year’s E3, and it’s shaping up to be a maddeningly-fun experience. The Sinking City is one of two Lovecraft-based games that saw the spotlight at E3 in June. The first is Call of Cthulhu, a survival-horror game being published by Focus Home Interactive. This one, however, is a narrative-focused adventure game that puts you in the shoes of an investigator named Charles Reed. It’s just had a gameplay trailer released, titled ‘A Close Shave,’ and it’s deliciously Eldritch-feeling. Whereas with Call of Cthulhu it looks like we’ll get a pretty standard survival horror experience, there seems to be more of a Bioshock vibe from The Sinking City trailer. There’s swing music, there are fish people stood beside barrel fires, there’s shotgunning action, and there’s even face-tentacle-shaving. From early builds shown to press on the E3 show floor, it all feels like an insane detective game with combat rather than a desperate bid to survive with your sanity intact. To have no Lovecraft games for a little while and suddenly see two pop up with projected releases quite soon to each other, it’s nice to know that either experience will have a different flavor to it. 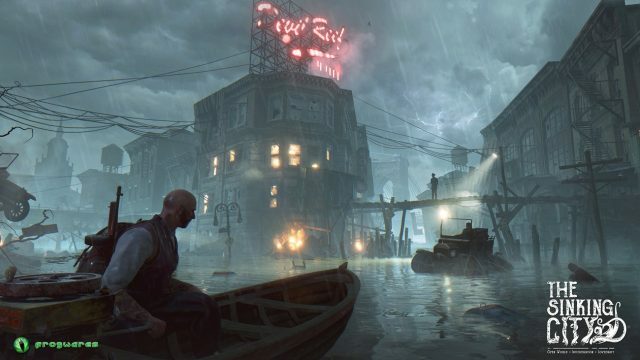 Perhaps one of the more significant differences lore-wise is that in The Sinking City, Deep Ones, the fish humanoids spawned of the Eldritch gods Dagon and Hydra, are walking about without any attempt at hiding – perhaps The Sinking City‘s Lovecraftian world isn’t such a secret and more part-and-parcel? In any case, we’ll be sure to find out more about this freaky sinking city than just what The Sinking City trailer has revealed to us when the game releases on March 21, 2019, for PC, Xbox One and PS4.